Become a Hospice Volunteer. There’s no time like the present to add life to each day of a hospice patient. Volunteers provide companionship and support to the terminally ill and their loved ones. They fill a unique role in providing comfort and support to patients and families by giving their time, energy and compassion. 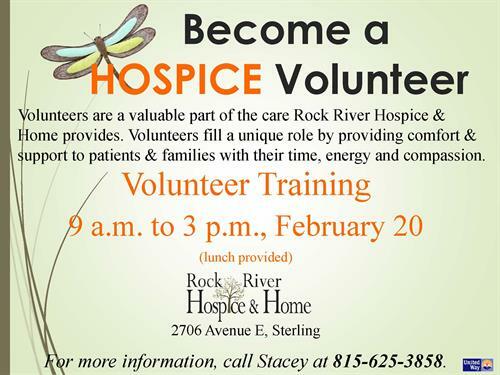 Rock River Hospice & Home has a need for volunteers to work with patients and families. A training session will be held from 9 a.m. to 3 p.m. on Wednesday, Feb. 20 at Rock River Hospice & Home, 2706 Avenue E, Sterling, IL. To make a difference in someone’s life, call Stacey at 815-625-3858 or email staceynielsen@hospicerockriver.org.